The presence of introns in a gene may facilitate the evolution of new and potentially beneficial proteins as a result of a process known as exon shuffling. Introns increase the probability of crossing over between the exons of alleles of a gene—simply by providing more terrain for crossovers without interrupting coding sequences. This might result in new combinations of exons and proteins with altered structure and function. We can also imagine the occasional mixing and matching of exons between completely different (nonallelic) genes. Exon shuffling of either sort could lead to new proteins with novel combinations of functions. While most of the shuffling would result in nonbeneficial changes, occasionally a beneficial variant might arise. Crossing over primarily happens because of homologous recombination (HR). From the molecular point of view, it can happen between any homologous regions and it is not necessary that an entire allele has to be crossed over. During the process of HR, a DNA double strand break occurs. This is followed by resection (exonucleolytic degradation of one of the strands — 5'→3', from the break-point) by the MRX complex which leads to formation of ssDNA ends. The length of these ssDNA ends dictate the total length of crossover region. Taken from: Branzei, Dana, and Marco Foiani. 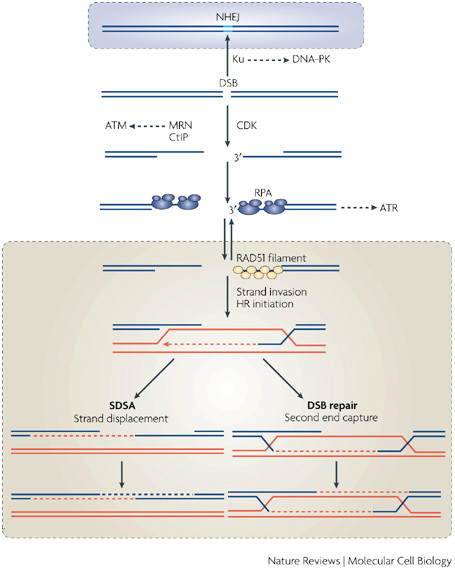 "Regulation of DNA repair throughout the cell cycle." Nature reviews Molecular cell biology 9.4 (2008): 297-308. This length can be from around 1.5kb to over 10kb depending on the repair kinetics with possibly an average of 3kb (more than half the cases) [1, 2]. Therefore, the author speculates that the probability of intra-gene crossover would increase with increase in intron length. However, in my knowledge, there are no recent reports to validate this hypothesis. LD breaks down in the region LRP5 g.5257T → G–LRP5 g.28149C → T, in intron 1 of theLRP5 gene. A second block of very strong LD (‖D'‖ > 0.9) is observed, LRP5 g.28149C → T–LRP5 g.45704G → A, spanning 17.6 kb of intron 1 to intron 3 of the LRP5 gene. Chung, Woo-Hyun, et al. "Defective resection at DNA double-strand breaks leads to de novo telomere formation and enhances gene targeting." PLoS Genet 6.5 (2010): e1000948. Zhou, Yi, et al. "Quantitation of DNA double-strand break resection intermediates in human cells." Nucleic Acids Research (2013): gkt1309. Twells, Rebecca CJ, et al. "Haplotype structure, LD blocks, and uneven recombination within the LRP5 gene." Genome Research 13.5 (2003): 845-855. 1) Does crossing over occur between gene loci, or can it occur within them? The cross-over events can happen within genes in introns and/or exons and still lead to viable gametes. The text is stating that it's the increased length from introns that increases the probability of a cross-over event there, which is basically true. This is simplified, and there are hotspots for crossing over and low probability areas. The exon shuffling between completely different genes would not occur by crossing over; there are other mechanisms that would lead to these kinds of structural rearrangements in gametes. 2) Would a new allele be formed by a cross-over between exons, and is this a type of mutation? A new allele could be formed if one arrangement of exons is allele1, another is allele2, and the cross-over involving 1 and 2 is uniquely allele3. If this happens by a cross-over event, it is not a mutation. Also, there is no "new" genetic material in allele3 even though it could be considered a new allele; it is only a new combination of sequence that existed in 1 and 2. Not the answer you're looking for? Browse other questions tagged human-biology genetics evolution molecular-biology molecular-genetics or ask your own question.